I might be in love – with a cake. No I’m serious, I am completely obsessed with this cake. I had seen a cake similar to this on Maggie Austin’s site and I was dying to try it. 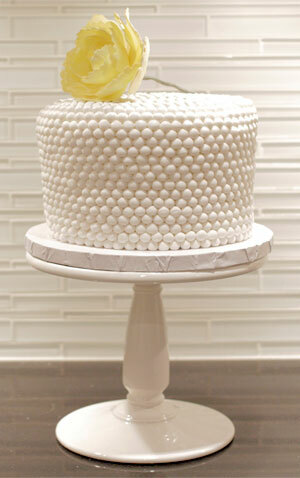 It looks like a thousand tiny pearls all painstakingly placed on the cake. When I realized that you don’t have to roll each fondant pearl individually, I decided this was something I could actually do! What I needed was a bead mold. These are silicone molds where you can press fondant into it and it creates a string of beads. These molds cost a small fortune but I’m sure I’ll use it over and over again. Plus, the result is absolutely gorgeous. It took me a while to get the hang of how much cornstarch you have to put in the mold before you put the fondant in so you can easily get the beads out but once I got that down the process of making all these beads was a very zen like and easy process. I probably had to make about 40 of these strands to cover the whole cake. I “glued” each strand on to a fondant covered cake with a tiny bit of sugar glue which is just gumpaste disolved in water. The flower on top is a peony that I made in my sugar flower class at the French Culinary Institute. I love how life like it looks! The cake is vanilla butter cake with vanilla butterceam. 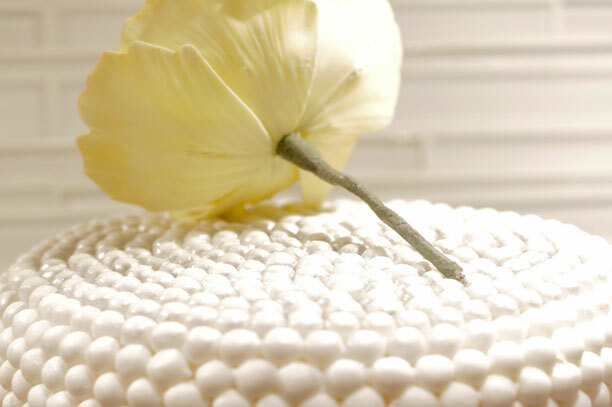 It’s topped with Satin Ice fondant and dusted with silver and white pearl dust. I’m taking this cake to my parent’s house in Maryland where we can all marvel at it. I’ll cry a single tear when we cut into it. For reals this is my favorite cake ever.